Some links to information about the !Kung. The !Kung is a name given to several tribes among the wider San people, who almost all live or lived until recently by hunting and gathering, as well as foraging. Colonial Europeans called the San "bushmen." In Botswana (language: Setswana) they were know as "Lesarwa" and "Masarwa" (Bushman), and in modern usage "Mosarwa" and "Basarwa". 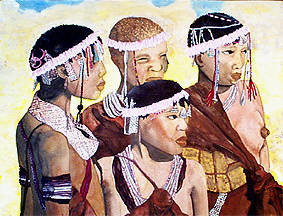 They are a group of tribal people who live in Southern Africa. The movie "The Gods Must be Crazy" features the !Kung.